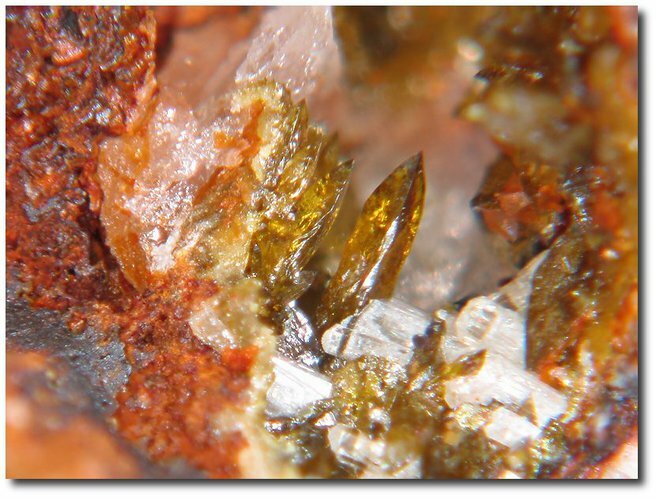 Beudantite: Mineral information, data and localities. Named by Armand Lévy in 1826 in honor of François Sulpice Beudant [September 5, 1787, Paris, France – December 10, 1850, Paris, France], systematic Mineralogist, University of Paris, Paris, France. Beudant introduced many new mineral names in his books that have superseded older names. The arsenate analogue of corkite with which a complete solid-solution range exists. Also forms a solid solution with segnitite and plumbojarosite from which it is difficult to distinguish. A secondary mineral occurring in the oxidized zones of polymetallic deposits. It shows a large variety of different habits (tabular, acute rhombohedral, pseudo-cubic, pseudo-cuboctahedral, very rarely also acicular). Some beudantite (and segnitite) may contain minor Sb replacing Fe. Compare chemically very similar unnamed species: UM1976-04-AsOSO:CuFeHPb and UM1975-08-AsOSO:FeHPb. Anomalously biaxial, exhibiting sectoring. Crystals may exhibit three biaxial sectors around an uniaxial core (Laurion). Pseudo-cubic. Crystals tabular, pseudo-cubes, pseudo-cuboctahedra or pseudo-octahedra; very rarely also acicular. Microcrystalline massive. Oxidized zone of a polymetallic ore deposit. Mimetite 90 photos of Beudantite associated with Mimetite on mindat.org. Carminite 68 photos of Beudantite associated with Carminite on mindat.org. Quartz 22 photos of Beudantite associated with Quartz on mindat.org. Cerussite 20 photos of Beudantite associated with Cerussite on mindat.org. Scorodite 19 photos of Beudantite associated with Scorodite on mindat.org. Segnitite 18 photos of Beudantite associated with Segnitite on mindat.org. Goethite 12 photos of Beudantite associated with Goethite on mindat.org. Bayldonite 11 photos of Beudantite associated with Bayldonite on mindat.org. Fluorite 11 photos of Beudantite associated with Fluorite on mindat.org. Baryte 10 photos of Beudantite associated with Baryte on mindat.org. Percy, J. (1850) On the composition of beudantite. Philosophical Magazine and Journal of Science: 37: 161-169. 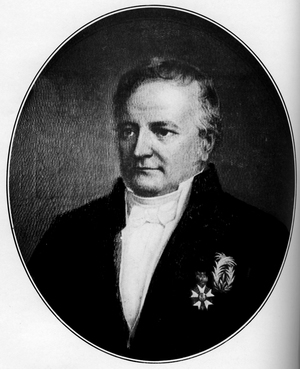 Dauber, H. (1857) Ueber Svanbergit und Beudantit. Annalen der Physik, Halle, Leipzig: 176: 579. Rammelsberg, C. (1857) Ueber die Zusammensetzung des Beudantits. Annalen der Physik, Halle, Leipzig: 176: 581-583. Sandberger, F. (1857) Ueber den Beudantit und seine Modificationen. Annalen der Physik, Halle, Leipzig: 176: 611-619. Lacroix (1915) Bulletin de la Société française de Minéralogie: 38: 35. Hintze, Carl (1931) Handbuch der Mineralogie. Berlin and Leipzig. 6 volumes: 1 [4A]: 729. Simpson (1938) Journal of the Royal Society of Western Australia: 24: 110. Palache, C., Berman, H., and Frondel, C. (1951) The System of Mineralogy of James Dwight Dana and Edward Salisbury Dana, Yale University 1837-1892, Volume II. John Wiley and Sons, Inc., New York, 7th edition, revised and enlarged, 1124 pp. : 1001-1002. Kingsbury, A.W.G. and Hartley, J. (1960) Carminite and beudantite from the northern part of the Lake District and from Cornwall. Mineralogical Magazine, vol. 32, n° 249, 423-432. Walenta, K. (1966) Beiträge zur Kenntnis seltener Arsenatmineralien unter besonderer Berücksichtigung von Vorkommen des Schwarzwaldes. 3. Folge. Tschermaks Mineral. Petrog. Mitt., 11, 121–164, esp. 122–129 (in German). Canadian Mineralogist: 26: 923-932. Szymański, J.T. (1988) The crystal structure of beudantite, Pb(Fe, Al)3[(As, S)O4]2(OH)6. Canadian Mineralogist, 26, 923–932. Giuseppetti, G. and Tadini, C. (1989) Beudantite: PbFe3(SO4)(AsO4)(OH)6, its crystal structure, tetrahedral site disordering and scattered Pb distribution. Neues Jahrbuch für Mineralogie, Monatshefte (1989): 27-33. Anthony, J.W., Bideaux, R.A., Bladh, K.W., and Nichols, M.C. (2000) Handbook of Mineralogy, Volume IV. Arsenates, Phosphates, Vanadates. Mineral Data Publishing, Tucson, AZ, 680pp. : 66. Sejkora, J., Škovíra, J., Čejka, J., and Plášil, J. (2009) Cu-rich members of the beudantite-segnitite series from the Krupka ore district, the Krušné hory Mountains, Czech Republic. Journal of Geosciences, 54, 355-371. Pekov, I.V., Khanin, D.A., Yapaskurt, V.O., Pakunova, A.V., and Ekimenkova, I.A. (2015) Minerals of the beudantite—segnitite series from the oxidation zone of Berezovskoe gold ore deposit, the Middle Urals: variations of chemical composition, behavior of admixtures, antimony-bearing varieties. Zapiski Rossiiskogo Mineralogicheskogo Obshchestva, 144 (3), 89-105. The following Beudantite specimens are currently listed for sale on minfind.com. ⓘ Cerro Blanco pegmatite district ? Chapman, J. & Scott, K. (2005): Supergene minerals from the oxidised zone of the Elura (Endeavor) lead-zinc-silver deposit. Australian Journal of Mineralogy, 11, 83-90. ; Loidl, Gernot C. (2012) The Elura Orebody: a multidisciplinary study investigating geochemical mineralogical & geometallurgical ore characteristics. PhD thesis Adelaide University; Leverett, P., McKinnon, A. R., & Williams, P. A. (2005). Supergene geochemistry of the Endeavor ore body, Cobar, NSW, and relationships to other deposits in the Cobar basin. Regolith 2005–Ten Years of CRC LEME, 191-194. Birch, W.D. (2017) Mineralogy of the Silver King deposit, Omeo, Victoria. The Royal Society of Victoria, 129:1, 41-52. Simpson, E.S. (1938) Journal of the Royal Society Western Australia, vol. 240, p. 110.; Palache, C., Berman, H., and Frondel, C. (1951) The System of Mineralogy of James Dwight Dana and Edward Salisbury Dana, Yale University 1837-1892, Volume II: 1002.; Kingsbury, A.W.G. and Hartley, J. (1960) Carminite and beudantite from the northern part of the Lake District and from Cornwall. Mineralogical Magazine, vol. 32, n° 249, 423-432. (referring to Simpson 1938 and Dana). ; Dana, J.D. (xxxx) A System of Mineralogy, 7th edition, vol. 2, p. 1002. Bottle Creek Gold deposits, Menzies District, Western Australia; IDM Robertson, CRC LEME, 2003; Taylor, G. F. (1998). Mineralogical and Geochemical Studies of Gossan and Wall Rocks, Bottle Creek, Western Australia. CRC LEME. Putz, H. (2007): Beiträge zur Landesmineralogie Salzburgs. Miner. Arch. Salzb. 12, 255-256.
ⓘ Rotem slag locality ? Sabina, A.P. (1967) Rocks & minerals for the collector: Eastern Townships and Gaspé, Quebec and parts of New Brunswick. Geological Survey of Canada Paper 66-51, 65. JAMBOR, J.L. & BOYLE, R.W. (1962): Gunningite, a new zinc sulphate from the Keno Hill B Galena Hill area, Yukon. Can. Mineral. 7, 209-218. Boyle, R.W. (1965) Geology, geochemistry, and origin of the lead-zinc-silver deposits of the Keno Hill-Galena Hill area, Yukon Territory. Geological Survey of Canada, Bulletin 111, 310 p.
E. Kocourková-Víšková, J. Loun, O. Sracek, S. Houzar & J. Filip (2015): Secondary arsenic minerals and arsenic mobility in a historical waste rock pile at Kaňk near Kutná Hora, Czech Republic. Mineralogy and Petrology 109, 17-33. Litochleb J., Sejkora J., Šrein V., Malec J.: Kašperskohorské zlato (Šumava, Česká republika). Bulletin Mineralogicko-petrografického oddělení Národního muzea v Praze, 2009, roč. 17, č. 1, s. 1-13. Barrie, C. T. et al. (2007): The Bisha Volcanic-Associated Massive Sulfide Deposit, Western Nakfa Terrane, Eritrea. Economic Geology 102, 717-38. GOURAULT C. (2006) - Nouvelles occurrences minéralisées en Haut Morvan. BOURGOGNE NATURE, n° 3, p. 55-67, 4 fig. GOURAULT C. (2011) - Minéralogie de la mine du Prabis ( Villapourcon, Nievre, France) . BOURGOGNE NATURE, n° 13, p. 96-116, 5 fig. Le Roch, P. (2009): Travaux routiers... et découvertes dans les Côtes-d'Armor, Le Cahier des Micromonteurs, 103, 19-22.
ⓘ Schletzenburg (Schletzelberg; incl. Donnerloch Mine) ? Johannet, J.-M.(2012): Mas du Rouvergue, Laval-Pradel, Gard. Le Cahier des Micromonteurs, 118, 3-5. Berbain, C., Favreau, G. & Aymar, J. (2005): Mines et Minéraux des Pyrénées-Orientales et des Corbières. Association Française de Microminéralogie Ed., 53-59. [UKJMM 2:11-15 "Cap Garonne Secondary Copper and Lead - W.R. van den Berg"]; GUILLEMIN, C. (1952) Etude minéralogique et métallogénique du gîte plumbocuprifère du Cap Garonne (Var). Bull. Soc. Franç. Minér. Crist., 75, 1-159.; KINGSBURY, A.W.G. and HARTLEY, J. (1960) Carminite and beudantite from the northern part of the Lake District and from Cornwall. Mineralogical Magazine, vol. 32, n° 249, 423-432. (referring to GUILLEMIN 1952). Markl, G. (1992): Listenergänzungen (Greenockit, Cuprit, Langit, Beudantit). Erzgräber 6 (1), 10-13.; Gröbner, J. (2007): Neufunde von der Eichhalde bei Biberach im Kinzigtal. Erzgräber 21, 21-26. Walenta, K. (1992): Die Mineralien des Schwarzwaldes. Chr. Weise Verlag, München, 336 pp. (in German); WALENTA, K. (1994): Beudantit, sulfatfreier Beudantit und Segnitit. - Lapis 19 (1), 23-26. ; WALENTA, K. (1995): Neue Mineralfunde von der Grube Clara. 6. Folge, 1. Teil. - Lapis 20 (5), 33-38. In the collection of Brent Thorne. Collected by Klaus Pettijean in 1997.
von Sandberger (1857) Annalen der Physik und Chemie (Poggendorff), vol. c, p. 612. Halle, Leipzig. ; Russell, A. (1910) On the occurrence of the rare mineral carminite in Cornwall. Mineralogical Magazine, vol. 15, n° 71, 285-287 (referring to von Sandberger 1857). ; Palache, C., Berman, H., and Frondel, C. (1951) The System of Mineralogy of James Dwight Dana and Edward Salisbury Dana, Yale University 1837-1892, Volume II: 913.; Kingsbury, A.W.G. and Hartley, J. (1960) Carminite and beudantite from the northern part of the Lake District and from Cornwall. Mineralogical Magazine, vol. 32, n° 249, 423-432.; Nickel & Nichols (1991) Mineral Reference Manual, p. 22. - Golze, R.; Henrich, M.; Hucko, S.; Stötzel, N. (2013): Siegerland & Westerwald. Bergbaugeschichte - Mineralienschätze - Fundorte, 480-88. Palache, Charles, Harry Berman & Clifford Frondel (1951), The System of Mineralogy of James Dwight Dana and Edward Salisbury Dana Yale University 1837-1892, Volume II, John Wiley and Sons, Inc., New York, 7th edition, revised and enlarged, 1124 pp. : 14; Lapis, 17 (9), 31-36. Sejkora, J., Čejka, J., Šrein, V. (2001): Pb dominant members of crandallite group from Cinovec and Moldava deposits, Krusne hory Mts. (Czech Republic). Journal of the Czech Geological Society 46, 53-68. J. Gröbner und U. Kolitsch (2002): Neufunde von Laurion aus den Jahren 2001 und 2002. Aufschluss 53 (5-6), 363-371. ; Rieck, B., Kolitsch, U., Voudouris, P., Giester, G. and Tzeferis, P. (2018): Weitere Neufunde aus Lavrion, Griechenland. Mineralien-Welt 29 (5), 32-77 (in German). ⓘ Thorikos Bay slag locality ? 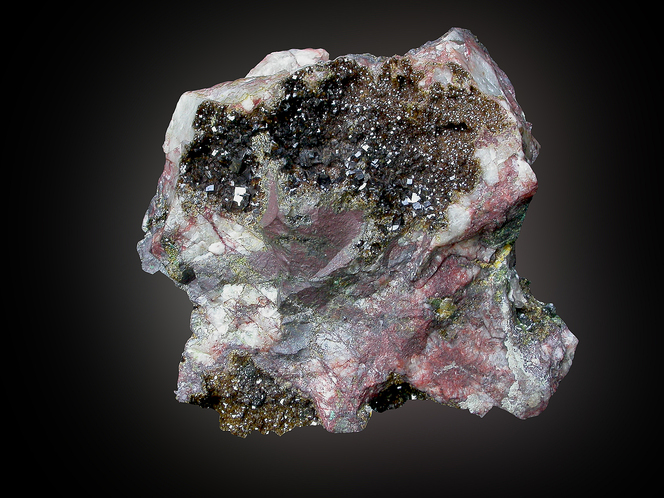 Ciriotti M.E., Biagioni C. (2011): Pot-pourri 2011: identificazioni di minerali di interesse. Micro, 9, 3 (3-2011), 125-133. Lastrico, S. (2006): La beudantite di Pastori. Prie, 2, 30. Albertini, C., Guastoni, A., Vanini, F. (2005): Fomarco. Beudantite, descloizite, stolzite e altri minerali secondari del giacimento di Case Bardot (Ossola). Rivista Mineralogica Italiana, 3/2005, 152-161. Stara, P., Rizzo, R. & Tanca, G. A. (1996) - Iglesiente, Arburese - Miniere e Minerali (vol. II) - Associazioni Mineralogiche Italiane Ed., 192 pp. SEM/EDX analysis by Dario Cericola; Ferretti, P., Camin, C., Fassina, B., Gentile, P., Rocchetti, I., Vecchi, F. (2018) Miniera Tingherla (Frassilongo, Valle del Fersina). Aggiornamento di una località classica della mineralogia trentina. Rivista Mineralogica Italiana, 42, 2 (2-2018), 108-141. Rocchetti I., Gentile P. and Ferretti P. (2012): La Miniera di Frattasecca presso Malga Broi (Novaledo, Trentino-Alto Adige). Storia e nuove segnalazioni mineralogiche. Studi Trentini di Scienze Naturali, 92, pagg. 167-180. Biagioni, C., Orlandi, P., Gini, C., Bargellini, C., Gamucci, C., Marinai, V., Nannoni, R. (2013): Botro ai Marmi. I minerali delle miniere Maffei e Montorsi. Riv. Mineral. Ital., 37, 1 (1-2013), 63-83. Saccardo D., Benincasa E., Malferrari D., Medici L., 2002. I minerali di Monte Cengio (Torrebelvicino, Vicenza). Riv. Miner. Ital., 1: 42-47. Hirama, T, Yamada, T., Shiobara, Y., Nakamura, H., Kosuge, Y., Fujiwara, T. (2011): "Pb-containing apatite supergroup minerals from Numata City, Gunma Prefecture, Japan." Abstracts for Annual Meeting of Japan Association of Mineralogical Sciences 2011(0), 146-146. Kouno, M. & Watanabe, H. (2007) Chigaku Kenkyu, 56, #1, 11-16. Von Bezing, L., Bode, R., and Jahn, S., (2008) Namibia Minerals and Localities. Edition Schloss Freudenstein, Bode Verlag GmbH, Haltern. 491 pp (in English). Kamphaug, E.(1986):Geologien i området Blystadlia-Rælingen. NAGS-nytt 13(3), 4-13. Rui Nunes and Pedro Alves collections; Marques de Sá, J.P. & Rewitzer, C. (2002): Gestoso: Seltene Arsenate aus einer Wolfram / Zinn - Mine im N Portugals. Lapis, 27 (1), 42-46. Wilson, W.E. (2016) The Berezovsk District, Sverdlov Oblast, Russia. 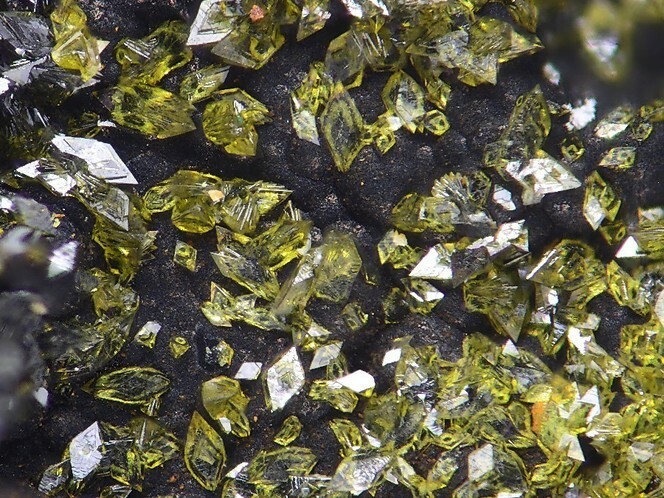 Mineralogical Record 47, 399-454.; Pekov, I. V., Khanin, D. A., Yapaskurt, V. O., Pakunova, A. V., & Ekimenkova, I. A. (2016). Minerals of the beudantite–segnitite series from the oxidation zone of the Berezovskoe gold deposit, middle Urals: Chemical variations, behavior of admixtures, and antimonian varieties. Geology of Ore Deposits, 58(7), 600-611. Cairncross, B. & Windisch, W.(1998). Robert Meyer collection. - Lopez Garcia J.A.(1987). Estudio mineralógico, textural y geoquímico de las zonas de oxidación de los yacimientos de Fe-Pb-Zn de la Sierra de Cartagena, (2ª parte: oxidación de paragénesis con greenalita-magnetita).Boletín Geológico y Minero, 98,670-679. Calvo, M. (2014) "Minerales y Minas de España", Vol. VI (Sulfatos (seleniatos, teluratos),cromatos,molibdatos y wolframatos). Escuela Técnica Superior de Ingenieros de Minas. Madrid. Kingsbury, A.W.G. and Hartley, J. (1960) Carminite and beudantite from the northern part of the Lake District and from Cornwall. Mineralogical Magazine, vol. 32, n° 249, 423-432.; Goley, P. and Williams R. (1995) Cornish Mineral Reference Manual. Endsleigh Publications. Kingsbury, A.W.G. (1954) Transactions of the Royal Geological Society of Cornwall, vol. 18, part 4 (for 1952), p. 392. Kingsbury, A.W.G. , Hartley, J. (1960) Carminite and beudantite from the northern part of the Lake District and from Cornwall. Mineralogical Magazine, 32(249), 423-432 (referring to Kingsbury 1954). Golley, P., Williams, R. (1995) Cornish Mineral Reference Manual. Endsleigh Publications, Truro, Cornwall. Betterton, J. (2000) Famous Mineral Localities: Penberthy Croft Mine, St. Hilary, Cornwall, England. UK Journal of Mines & Minerals, 20, 7-37.
ⓘ Old Treburgett Mine ? ⓘ Dry Gill Mine ? Kingsbury, A.W.G. and Hartley, J. (1960) Carminite and beudantite from the northern part of the Lake District and from Cornwall. Mineralogical Magazine, 32(249), 423-432.; Hartley, J. (1984) A list of minerals associated with the ore deposits of the Caldbeck Fells, Cumbria. Transactions of the Leeds Geological Association, 10(3), 22-39.; Cooper, M.P. and Stanley, C.J. (1990) Minerals of the English Lake District: Caldbeck Fells. Natural History Museum Publications, London, 160 pp. (referring to Kingsbury & Hartley, 1960 and Hartley, 1984). ; Green, D.I., Bridges, T.F., Rumsey, M.S., Leppington, C.M., and Tindle, A.G. (2008) A review of the mineralogy of the Roughton Gill Mines, Caldbeck Fells, Cumbria: Part 2 The Roughton Gill South Vein on Balliway Rigg. Journal of The Russell Society, 11, 3-28 (referring to Kingsbury). Kingsbury, A.W.G. and Hartley, J. (1957) Beaverite from the Lake District. Mineralogical Magazine, 31(239), 700-702.; Kingsbury, A.W.G. and Hartley, J. (1960) Carminite and beudantite from the northern part of the Lake District and from Cornwall. Mineralogical Magazine, 32(249), 423-432.; Hartley, J. (1984) A list of minerals associated with the ore deposits of the Caldbeck Fells, Cumbria. Transactions of the Leeds Geological Association, 10(3), 22-39.; Cooper, M.P. and Stanley, C.J. (1990) Minerals of the English Lake District: Caldbeck Fells. Natural History Museum Publications, London, 160 pp. (referring to Kingsbury & Hartley, 1957-1960 and Hartley, 1984). ; Green, D.I., Bridges, T.F., Rumsey, M.S., Leppington, C.M., and Tindle, A.G. (2008) A review of the mineralogy of the Roughton Gill Mines, Caldbeck Fells, Cumbria: Part 2 The Roughton Gill South Vein on Balliway Rigg. Journal of The Russell Society, 11, 3-28. (referring to Kingsbury). Green, D.I., Rumsey, M.S., Bridges, T.F., and Thomson, N. (2009) A Review of the mineralisation at Ingray Gill, Caldbeck Fells, Cumbria. Journal of the Russell Society, 12, 33-45. (referring to Kingsbury). Kingsbury, A.W.G. and Hartley, J. (1957) New occurrences of arseniosiderite. Mineralogical Magazine, 31( 237), 499-500.; Cooper, M.P. and Stanley, C.J. (1990) Minerals of the English Lake District: Caldbeck Fells. Natural History Museum Publications, London, 160 pp. Kingsbury, A.W.G. and Hartley, J. (1957) New occurrences of arseniosiderite. Mineralogical Magazine, 31(237), 499-500.; Kingsbury, A.W.G. and Hartley, J. (1960) Carminite and beudantite from the northern part of the Lake District and from Cornwall. Mineralogical Magazine, 32(249), 423-432.; Hartley, J. (1984) A list of minerals associated with the ore deposits of the Caldbeck Fells, Cumbria. Transactions of the Leeds Geological Association, 10(3), 22-39.; Cooper, M.P. and Stanley, C.J. (1990) Minerals of the English Lake district: Caldbeck Fells. Natural History Museum Publications, London, 160 pp. (referring to Kingsbury & Hartley, 1960 and Hartley, 1984). Kingsbury, A.W.G. (1951) (unpublished manuscript on the minerals of the northern Lake District. ); Kingsbury, A.W.G. and Hartley, J. (1958) Jarosite and natrojarosite from the Lake District. Mineralogical Magazine, 31(240), 813-815.; Kingsbury, A.W.G. and Hartley, J. (1960) Carminite and beudantite from the northern part of the Lake District and from Cornwall. Mineralogical Magazine, 32(249), 423-432.; Cooper, M.P. and Stanley, C.J. (1990) Minerals of the English Lake District: Caldbeck Fells. Natural History Museum Publications, London, 160 pp. ; Green, D.I., Bridges, T.F., Rumsey, M.S., Leppington, C.M., and Tindle, A.G. (2008) A review of the mineralogy of the Roughton Gill Mines, Caldbeck Fells, Cumbria: Part 2 The Roughton Gill South Vein on Balliway Rigg. Journal of The Russell Society, 11, 3-28. Kingsbury, A.W.G. and Hartley, J. (MS) (1951) New occurrences of rare minerals in the northern part of the English Lake District: part 1.; Kingsbury, A.W.G. and Hartley, J. (1958) Jarosite and natrojarosite from the Lake District. Mineralogical Magazine, 31(240), 813-815.; Kingsbury, A.W.G. and Hartley, J. (1960) Carminite and beudantite from the northern part of the Lake District and from Cornwall. Mineralogical Magazine, 32(249), 423-432.; Hartley, J. (1984) A list of minerals associated with the ore deposits of the Caldbeck Fells, Cumbria. Transactions of the Leeds Geological Association, 10(3), 22-39.; Cooper, M.P. and Stanley, C.J. (1990) Minerals of the English Lake District: Caldbeck Fells. Natural History Museum Publications, London, 160 pp. (referring to Kingsbury & Hartley, 1951-1960 and Hartley, 1984). Kingsbury, A.W.G. and Hartley, J. (1960) Carminite and beudantite from the northern part of the Lake District and from Cornwall. Mineralogical Magazine, vol. 32, n° 249, 423-432.; BMS Database. Kingsbury, A.W.G. and Hartley, J. (MS) (1951) New occurrences of rare minerals in the northern part of the English Lake District: part 1.; Kingsbury, A.W.G. and Hartley, J. (1956) New occurrences of vanadium minerals (mottramite, descloizite, and vanadinite) in the Caldbeck area of Cumberland. Mineralogical Magazine, 31(235), 289-295.; Kingsbury, A.W.G. and Hartley, J. (1957) Beaverite from the Lake District. Mineralogical Magazine, 31(239), 700-702.; Kingsbury, A.W.G. and Hartley, J. (1960) Carminite and beudantite from the northern part of the Lake District and from Cornwall. Mineralogical Magazine, 32(249), 423-432.; Hartley, J. (1984) A list of minerals associated with the ore deposits of the Caldbeck Fells, Cumbria. Transactions of the Leeds Geological Association, 10, 22-39.; Young, B. (1987) Glossary of the minerals of the Lake District and adjoining areas. British Geological Survey, Newcastle upon Tyne, 104 pp. ; Cooper, M.P. and Stanley, C.J. (1990) Minerals of the English Lake District: Caldbeck Fells. Natural History Museum Publications, London, 160 pp. ; Cooper, M.P. and Stanley, C.J. (1991) Famous mineral localities: Pyromorphite group minerals from the Caldbeck Fells, Cumbria, England. Mineralogical Record, 22(2), 105-121 (referring to Hartley, 1984). ; BMS Collection. Anthony, J.W., et al (1995), Mineralogy of Arizona, 3rd.ed. : 135. In collection of Tom Trebisky. Collected 1980. Analyzed Bart Cannon 2009.
ⓘ Preble Hill Mine (Jones Mine) ? ⓘ Stevenson-Bennett Mine (Stephenson-Bennett Mine) ? ⓘ McCauley prospect 17 ? Collected by and in the collection of Chuck Adan. ⓘ Island Ford Cave ? Falls, R., Cannon, B. & Mandarino, J. A. (1985): Schultenite from King County, Washington, USA; a second occurrence, and review. Mineralogical Magazine 49, 65-69.